Britain acted illegally when it imposed territorial controls on the Chagos Islands without the consent of Mauritius, a UN judgment claims. The ruling may hinder US operations in Diego Garcia, where it holds an airbase on lease from the British. The UN ruling also accuses Britain of ignoring the rights of Mauritius – which claims the islands as its own. Declaring the remote Indian Ocean archipelago a marine protected area (MPA) has damaged the fishing industry in surrounding waters, Mauritius claims. The British Labour government of the time is accused of forcing through the MPA measure to strengthen its hand in the impending election. “The UK has not been able to provide any convincing explanation for the urgency with which it proclaimed the MPA on 1 April 2010,” the ruling states. The speed of the decision was “dictated by the electoral timetable in the United Kingdom or an anticipated change of government,” it was found. The issue was addressed by a panel of five judges serving on the permanent court of arbitration, based in The Hague. The Mauritian government maintains its own sovereign claim, arguing the islands were effectively stolen by Britain in contravention of a UN resolution that segments of decolonizing nations could not simply be detached by the departing colonial power. The Mauritian claim was succored by the ruling, which found that “The United Kingdom’s undertaking to return the Chagos archipelago to Mauritius gives Mauritius an interest in significant decisions that bear upon the possible future uses of the archipelago. The move will be welcomed by displaced former residents of the Chagos Islands, who were forced from of their homes by the British in the 1960s to make way for the current US base. 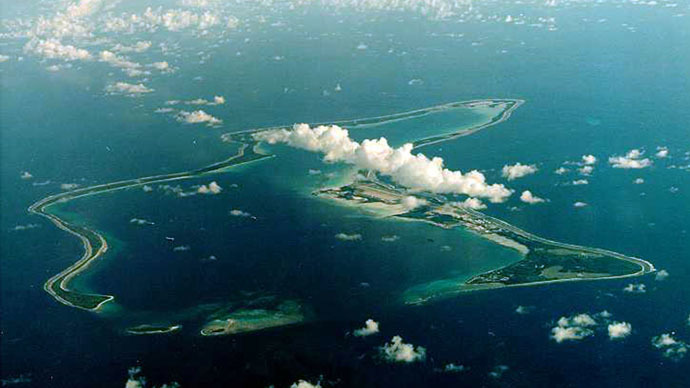 Diego Garcia has repeatedly made headlines over allegations that US extraordinary rendition flights were routed through the airbase.